Hands down the most asked about plant this week is bridal’s veil or nodding clerodendron (C. wallichii). It’s right outside the Naples Garden Club door. Masses of large white lacey blooms cascade from arching branches like a living veil. This has been its best year yet. The other question has been about the golf-ball size fruit on the palm outside the Windstar Garden Room. The fruit of the fox-tail palm (Wodyetia bifurcate) is very showy. It is edible although not very palatable and, with enough sugar, can be used to make jams and jellies. The seed is poisonous. There’s something about free admission that gets people moving. The Garden has had a record number of visitors during this last two-week free period. We’re definitely going out with a bang at close tomorrow. 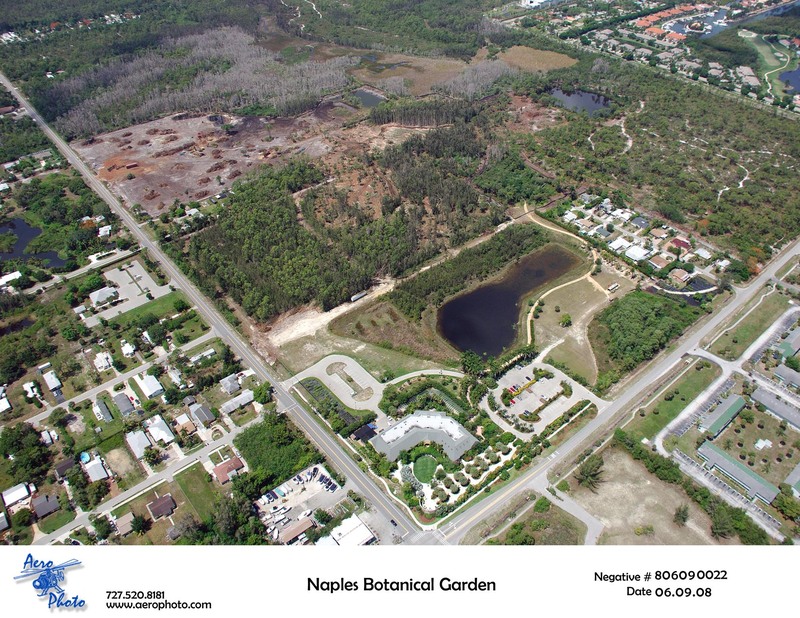 Friday’s Showcase of the Naples Daily News featured the Garden in its “pick” for the weekend. The Horticulture staff has been kept on alert trying to keep ahead of the site work as bulldozers uncover large specimen trees. Among the prized trees are water oaks (Quercus nigra), royal palms (Roystonea regia), black mangroves (Avicennia germinans), pond apples (Annona glabra), and paurotis palms (Acoelorrhaphe wrightii). A large slash pine (Pinus elliottii) hammock was discovered and preserved. Other work in progress is the emptying out of the Horticulture garage, no small feat for those of you have seen it in recent months. A storage trailer was purchased to catch the overflow, namely tractor, off-road vehicle, golf cart, etc, and positioned out in the field near Gumby. Once empty, the hort garage will be converted into offices and communication center for the construction team. Sunday—our first closed day—the first of the birds head out for new homes. We finally found a home for the little birds—red-capped cardinals, honeycreepers, saffron finches, and bananaquits—with the breeder who originally supplied them. They along with 5 sun conures and 2 rainbow lorikeets start their journey to new homes Sunday. The rest of the feathered gang is here till Monday. Can you picture them netting those little birds; much less the ducks, shooting like Luke Skywalker through the butterfly canyon? We’ve got to get some pictures. The toughest part of this week has been seeing butterfly house volunteers go. Some of you have been with the Butterfly House since the very beginning, October 2005. Sally Richardson says we’ll dream up some fun things to do to together this summer just to keep in touch. She welcomes suggestion for a field trip. I can no longer say “see you around the garden,” can I? But I will keep these emails coming. Stay in touch!